In the closing months of 2018, NVIDIA finally released the long-awaited successor to the Pascal-based GeForce GTX 10 series: the GeForce RTX 20 series of video cards. Built on their new Turing architecture, these GPUs were the biggest update to NVIDIA's GPU architecture in at least half a decade, leaving almost no part of NVIDIA's architecture untouched. So far we’ve looked at the GeForce RTX 2080 Ti, RTX 2080, and RTX 2070 – and along with the highlights of Turing, we’ve seen that the GeForce RTX 20 series is designed on a hardware and software level to enable realtime raytracing and other new specialized features for games. While the RTX 2070 is traditionally the value-oriented enthusiast offering, NVIDIA's higher price tags this time around meant that even this part was $500 and not especially value-oriented. Instead, it would seem that the role of the enthusiast value offering is going to fall to the next member in line of the GeForce RTX 20 family. And that part is coming next week. Launching next Tuesday, January 15th is the 4th member of the GeForce RTX family: the GeForce RTX 2060 (6GB). Based on a cut-down version of the same TU106 GPU that's in the RTX 2070, this new part shaves off some of RTX 2070's performance, but also a good deal of its price tag in the process. And for this launch, like the other RTX cards last year, NVIDIA is taking part by releasing their own GeForce RTX 2060 Founders Edition card, which we are taking a look at today. 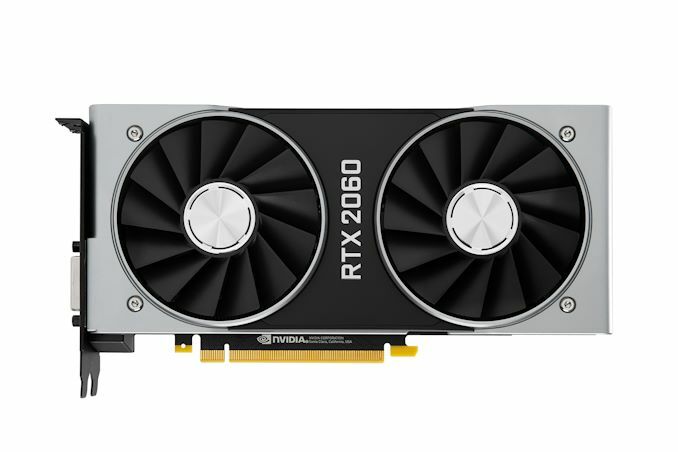 Like its older siblings, the GeForce RTX 2060 (6GB) comes in at a higher price-point relative to previous generations, and at $349 the cost is quite unlike the GeForce GTX 1060 6GB’s $299 Founders Edition and $249 MSRP split, let alone the GeForce GTX 960’s $199. At the same time, it still features Turing RT cores and tensor cores, bringing a new entry point for those interested in utilizing GeForce RTX platform features such as realtime raytracing. Diving into the specs and numbers, the GeForce RTX 2060 sports 1920 CUDA cores, meaning we’re looking at a 30 SM configuration, versus RTX 2070’s 36 SMs. As the core architecture of Turing is designed to scale with the number of SMs, this means that all of the core compute features are being scaled down similarly, so the 17% drop in SMs means a 17% drop in the RT Core count, a 17% drop in the tensor core count, a 17% drop in the texture unit count, a 17% drop in L0/L1 caches, etc. Speaking of video memory, NVIDIA has called this the RTX 2060 but early indications are that there will be different configurations of RTX 2060s with less VRAM and possibly fewer CUDA cores and other hardware resources. Hence, it seems forward-looking to refer to the product mentioned in this article as the RTX 2060 (6GB); as you might recall, the GTX 1060 6GB was launched as the ‘GTX 1060’ and so appeared as such in our launch review, up until a month later with the release of the ‘GTX 1060 3GB’, a branding that does not indicate its lower-performing GPU configuration unrelated to frame buffer size. Combined with ongoing GTX 1060 naming shenanigans, as well as with GTX 1050 variants (and AMD’s own Polaris naming shenanigans also of note), it seems prudent to make this clarification now in the interest of future accuracy and consumer awareness. Moving on, NVIDIA is rating the RTX 2060 for a TDP of 160W. This is down from the RTX 2070, but only slightly, as those cards are rated for 175W. Cut-down GPUs have limited options for reducing their power consumption, so it’s not unusual to see a card like this rated to draw almost as much power as its full-fledged counterpart. All-in-all, the GeForce RTX 2060 (6GB) is quite the interesting card, as the value-enthusiast segment tends to be more attuned to price and power consumption than the performance-enthusiast segment. Additionally, as a value-enthusiast card and potential upgrade option it will also need to perform well on a wide range of older and newer games – in other words, traditional rasterization performance rather than hybrid rendering performance. Meanwhile, looking at evaluating the RTX 2060 itself, measuring generalizable hybrid rendering performance remains unclear. Linked to the Windows 10 October 2018 Update (1809), DXR has been rolled-out fairly recently. 3DMark’s DXR benchmark, Port Royal, is due on January 8th, while for realtime raytracing Battlefield V is the sole title with it for the moment, with optimization efforts are ongoing as seen in their recent driver efforts. Meanwhile, it seems that some of Turing's other advanced shader features (Variable Rate Shading) are only currently available in Wolfenstein II. Of course, RTX support for a number of titles have been announced and many are due this year, but there is no centralized resource to keep track of availability. It’s true that developers are ultimately responsible for this information and their game, but on the flipside, this has required very close cooperation between NVIDIA and developers for quite some time. In the end, RTX is a technology platform spearheaded by NVIDIA and inextricably linked to their hardware, so it’s to the detriment of potential RTX 20 series owners in researching and collating what current games can make use of which specialized hardware features they purchased. So the RTX 2060 (6GB) is in a better situation than the RTX 2070. With comparative GTX 10 series products either very low on stock (GTX 1080, GTX 1070) or at higher prices (GTX 1070 Ti), there’s less potential for sales cannibalization. And as Ryan mentioned in the AnandTech 2018 retrospective on GPUs, with leftover Pascal inventory due to the cryptocurrency bubble, there’s much less pressure to sell Turing GPUs at lower prices. So the RTX 2060 leaves the existing GTX 1060 6GB (1280 cores) and 3GB (1152 cores) with breathing room. That being said, $350 is far from the usual ‘mainstream’ price-point, and even more expensive than the popular $329 enthusiast-class GTX 970. Across the aisle, the recent Radeon RX 590 in the mix, though its direct competition is the GTX 1060 6GB. Otherwise, the Radeon RX Vega 56 is likely the closer matchup in terms of performance. Even then, AMD and its partners are going to have little choice here: either they're going to have to drop prices to accomodate the introduction of the RTX 2060, or essentially wind down Vega sales. Unfortunately we've not had the card in for testing as long as we would've liked, but regardless the RTX platform performance testing is in the same situation as during the RTX 2070 launch. Because the technology is still in the early days, we can’t accurately determine the performance suitability of RTX 2060 (6GB) as an entry point for the RTX platform. So the same caveats apply to gamers considering making the plunge. FWIW, the RX 580 can regularly be had for ~$200 these days, so TECHNICALLY benedict is right - the 580 goes for ~57% of the 2060's MSRP ($349) but offers more like 60-65% of the performance (and that's assuming you can find the 2060 for MSRP, which we'll have to see). He is completely right - RTX2060 has 48 ROPs and 6 GB VRAM, which is pointless at $349, regardless how "fast" is the card. Raytracing is also pointless with so scarcely resourced card. At this point a person should either buy 2080Ti, if money are no object, or buy Radeon 580 8GB for under $200. Most modern games simply manage huge textures in VRAM - you need more RAM, quick memory buses and ROPs for that. Real world results matter more than on paper specs. The actual real world benchmarks show the Gtx2060 is 50-60% faster than the rx580. You seem to be overly hung up on VRAM and ROPs. Anadtech and techspot have done plenty of tests on VRAM, and modern games dont use nearly as much VRAM as you think - even on 1440p. And take a look at the 4k benchmarks in the article. The 6Gb vram is clearly sufficient. Furthermore, the rx580 8gb costs about $200-250 new, whereas the 2060 is $350 for the more expensive founders edition. Realistically, the aftermarket cards will be something like 200-250 for new rx580s vs 300 for a new non FE 2060. There are several RX580 8GB cards sales today for around $160-170. It night be old, it might be hot, but runs 1080p just perfect on any game, and it costs half. Next generation consoles are already well into making, and developers are developing games for consoles, not for PCs, which will never change since the scale of business is tenfold if not larger. Next might be game services directly integrated in the TV or whatever device gives a mass market, but would never be a PC. Anyway, new consoles will have A LOT more VRAM, and 6GB will simply not cut it. And they are coming later this year/early next year, not like waiting ten years for it. I have lived through enough NVidia "cycles" and can tell you this is typical NVidia greed - narrow memory bus and limited memory - exactly like 12 years ago, when AMD had nothing, but came with the rough, hot unoptimized 5850 and collected half of the market.